They were best friends, and rivals, and then enemies. They were dead, then alive, and then—Eli killed Victor, once and for all. Or so he thought—but Sydney Clarke felt otherwise, and used her own superpower to tip the scales. Now, a trio hides in the shadows, while another takes advantages of post-death life to take over the city of Merit. I am so happy that the second book in this series didn’t disappoint. I am always worried about sequels to a book I loved because I am afraid I will be disappointed. 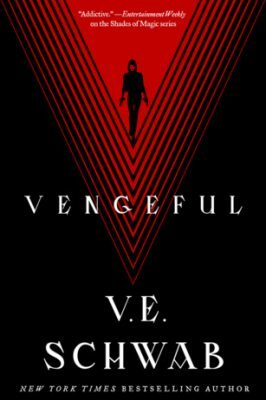 That was definitely not the case with this follow up to Vicious! 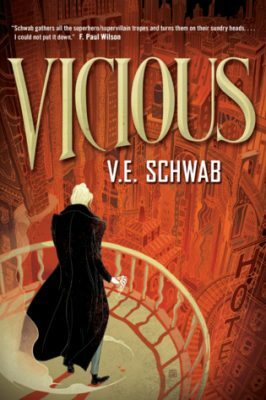 Schwab delves even deeper into the story of Eli & Victor while bringing new, powerful characters into the mix. I feel like this book did much more of the jumping back & forth between both characters and time. A lot of the time that would become utterly confusing but Schwab has a way of doing it where you don’t get lost. You know exactly where in time and with whom you are with. I loved reading more about how Eli came to be, I still do not like him but it helped me understand him much more. I loved how Sydney became a bigger player and also the introduction of Marcella & June. The story was great, the writing was great, the character development was great…the book was just great! It also left it open for a 3rd book in the series so fingers crossed!!! I wasn’t overly thrilled with this prompt so I randomly picked this book to read because it was highly reviewed and boy am I so glad I did. I absolutely LOVED this book! It reminded me a little bit of the show Heroes, which I loved. It was well written, the hoping back and forth between time & characters was well done, and it kept me hooked from beginning to end. I never wanted to put it down. The whole time I was trying to decide which power I would want and I think I would have to choose Serena’s. To be able to make people do whatever you want, man that is tempting. I, of course, would use it for good. 🙂 While Victor is meant to be the villain I was on his side most of the book. I usually am for people doing bad if it is for the greater good but the lengths that Eli went to made me mad time and time again. Plus I love the relationship between Victor, Sydney, & Mitch so much. 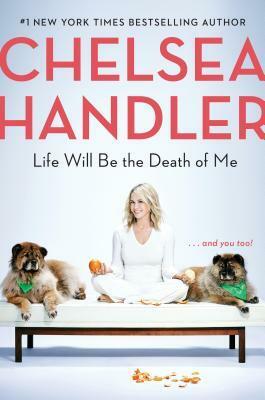 I can’t wait until the second book comes out next month. I already have it on hold at the library. I really want to see where the story goes.